David Zweig is Chair Professor, Division of Social Science, and Director, Center on China’s Transnational Relations (www.cctr.ust.hk), HKUST. He also teaches in the EMBA and MBA programs at the School of Business Management at HKUST. He is a Senior Research Fellow, Asia-Pacific Foundation of Canada; Adjunct Professor, School of Social Sciences and Humanities, National University of Defense Technology, Changsha, Hunan; and Vice-President of the Center on China’s Globalization (Beijing). In June 2012, he gave the former head of the Organization Department of the Chinese Communist Party, Li Yuanchao (the current Vice President), an evaluation of the CCP’s 1000 Talent Program. He has lived in the Mainland for 4 years (1974-76, 1980-81, 1986 and 1991-92), and in Hong Kong since 1996. In 1984-85, he was a Postdoctoral Fellow at Harvard University. His PhD is from The University of Michigan (Political Science, 1983). He is the author of four books, including Internationalizing China: domestic interests and global linkages (Cornell Univ. Press, 2002) and a new edited book, Sino-U.S. Energy Triangles: Resource Diplomacy under Hegemony, with Hao Yufan (Routledge, 2015). Recent consultancies include reports for the Central Policy Unit, Government of Hong Kong, the Guangdong Provincial Government, Goldman Sachs, Handelsbank Capital Markets, and Deutsche Bank. Since 1993, China became a net importer of energy. This lecture will discuss six strategies employed by China to increase its supply of oil and decrease its dependency on the global energy system. The strategies that will be discussed include: 1. diversifying suppliers; 2. building pipe lines; 3. improving technology and energy efficiency; 4. shifting to alternative energy sources; 5. building a strategic reserve; and 6. improving its ability to protect its sea lanes. 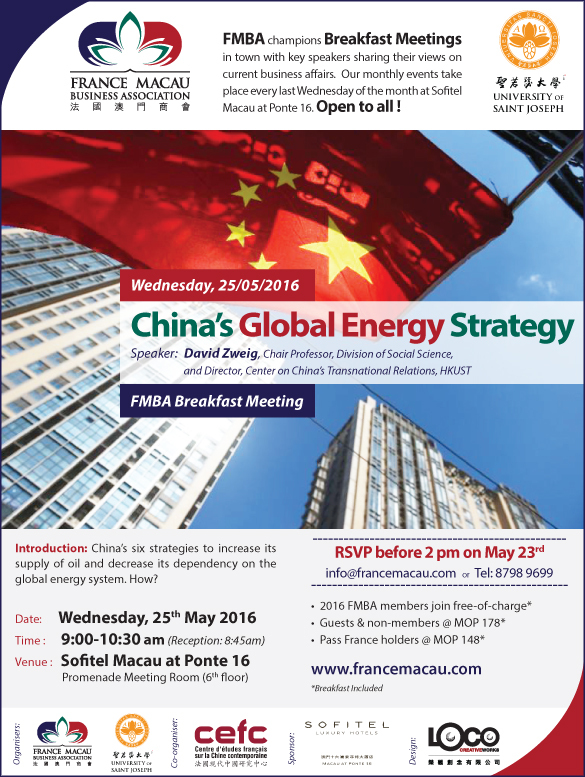 The presentation will look at China’s strategies as applied to Iran, Angola and Australia. This roundtable will be held in English.